Keith Curle says he knows which players will be staying and going ahead of next season - and has told Cobblers supporters to expect a ‘busy summer’ of recruitment activity. Curle has had since October to run the rule over ths current Town squad, and has made no secret of the fact he is not satisfied with what he has at his disposal. With several players’ contracts up this summer, there is an ideal chance for Curle to shake things up, and that is exactly what he intends to do. But it is likely it won't just be players out of contract who will be told their futures lie elsewhere, with Curle keen to totally restructure a playing group he feels is lacking in key areas, although nothing will be made official until after the final ball of the season has been kicked. Brought in to save the club from the threat of relegation after a poor start to the season under Dean Austin, Curle has done that, and now he says he is concentrating on the next task in hand, which is challenging to win promotion from Sky Bet League Two. "Ultimately, we have gained enough points for the primary target, which was staying in the division comfortably, and putting platforms and foundations for the club to move forward," said the Town boss. "That has been an important part of the remit since I came in, and I have to say there has been a good reaction from the changing room. "So page one is nearly complete, but quickly we need to turn the page and we need to move on to continued growth as a club. “There has to be a plan in place, and recruitment is going to be vitally important in the summer. So has Curle made up his mind which of the current players are staying and going? “Yes I have,” he said. “And I have a document here of 60 or 70 pages listing players who are out of contract at the end of this season, so there is a large market in the summer to go shopping from. “But just because the player is out of contract isn’t enough, they have to be the right player, and have to have the right attributes to fit into what what we are trying to build, mould and evolve into as a football club. “Simon Tracey is the head of recruitment and he is working very, very hard at the minute, gathering information. "It is not purely about ability, it is about character, and the players have to have a hunger and a desire to develop, improve, and fit in with the steps we are trying to build here. 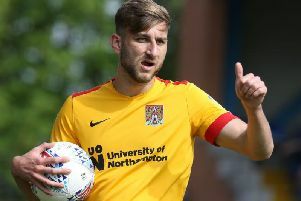 Players out of contract at the Cobblers this summer include John-Joe O'Toole, David Buchanan, Shay Facey, Dean Bowditch, Jack Bridge, Sam Foley, Luke Coddington and Daniel Powell. The Cobblers, who are currently in 14th place in league two, nine points off the play-offs and 16 points above the relegation zone, have five matches remaining this season, starting with the visit of second-placed Mansfield Town on Saturday.